Come and learn more about the 15-credit Interdisciplinary Tropical Studies (BITS) program, located at McGill's Caribbean campus, the Bellairs Research Institute. This is Canada's only teaching and research facility in the tropics. 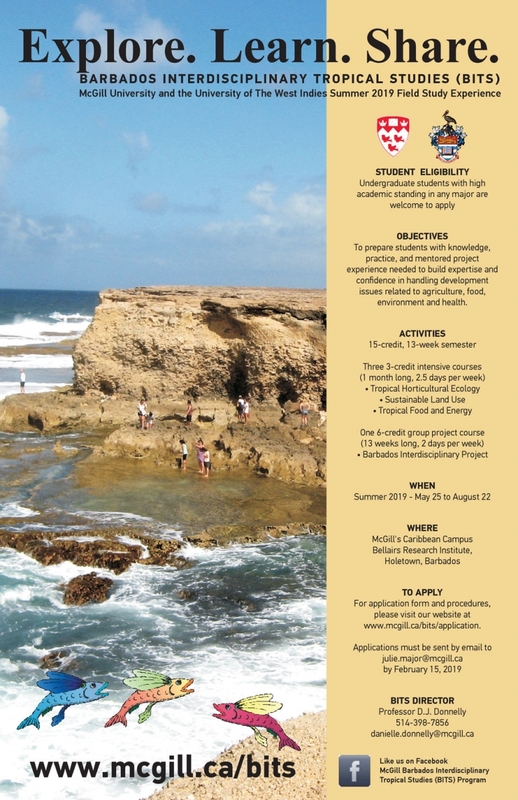 This summer program is an activity-filled, hands-on study experience for students with an interest in international studies with a Caribbean flavour. It exposes students to a wide range of agri-food-energy industries and related socio-economic issues in Barbados. Intensive course work is integrated with group project work and contributes to the formation of professionals with planning, managing, decision-making, and communication skills. The program addresses a global need for experienced international professionals capable of interacting with various levels of government, non-governmental organizations, and the private sector. We can answer all your questions. Visit our table in the Macdonald-Stewart lobby, Wednesday Feb 13 and Thursday Feb 14 from 11h-14h.